In less than 2 days, the lines of soccer moms in minivans with 4 kids extend outside the entrance of every Starbucks, and the barista' behind the counter will be in full on chaos mode - because after all, it will be the official nightmare of all Starbucks barista' annual dreams- frappy hour. From May 5 to 14, every day from 3-6pm, the infamous coffee chain will be serving up half-price frappuccinos. 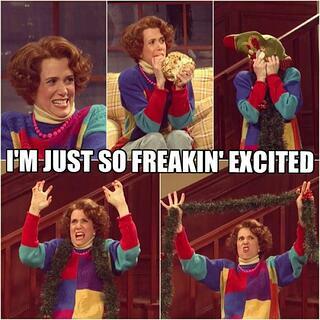 While every frappuccino loving addict is counting down the hours for the glorious days of Frappuccino Happy Hour. If only event professionals could get every single conference or event attendee to be so eager in excitement prior to an event! The truth is, if any 'non-event professional' may understand the amount of work it takes preparing for an event, executing an event, and collecting data and then having just enough time to re-coop to rinse and repeat - it is a Starbucks barista. Have you ever next in line to a patron at Starbucks and their order sounded something like this: "Venti Iced Skinny Hazelnut Macchiato, Sugar-Free Syrup, Extra Shot, Light Ice, No Whip". You aren't even the barista but your eyes begin to roll. You can't even imagine how the barista had enough time to write all that on the cup, let alone the ridiculousness of the order. 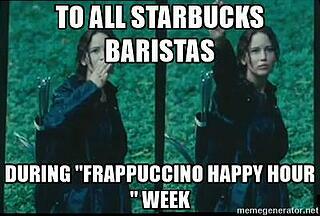 Welcome to every day being a Starbucks barista. Dealing with impatient customers and ridiculous demands, and somehow doing it all with a smile. If they have mastered this act, they can certainly handle the event professional world - dealing with attendees, vendors, sponsors, venues and the many other time's event professionals want to roll their eyes, and instead politely smile. Starbucks customers are no joke - and mistakes aren't something anyone has time for, nor wants to pay for - even if it was just putting the wrong sticker, on the right drink. There's no room for mistakes - and if heaven forbids a mistake does happen - every barista seems to instinctively know how to fix it - no matter what it is. It's kind of like the event professional who discovers once on-site, that the venue's air conditioning isn't working (and it's 100 degrees outside), the F&B vendor suddenly is a no-show, and the event audio/visual guy that your great Uncle Vinny recommended is actually a high school kid with braces and no equipment. Have no fear - event professionals, like baristas, are experts at last minute solutions. There are not many jobs that require genuine smiles when you want to roll your eyes - or that require you to be able to run a marathon in heels and/or a tie. Working on your feet day after day is not easy - nor is the running around and still managing to look presentable and not a hot, sweaty mess. Baristas have mastered the event professional skill of working on their feet for countless hours and being on the go non-stop, and still looking like you just put on their freshly pressed uniform. Of the many skills and attributes that event professionals must have, one of the more challenging ones is perhaps the awareness that even after an event concludes, and all the hard work and dedication results in a successful event or conference - there's still more hard work, more events, and more to be done. 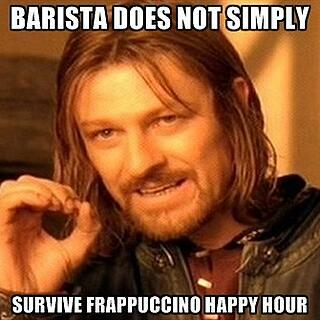 Baristas may dread the days of Frappuccino Happy Hour, and rejoice when that last soccer parent shuts the door with their half priced frap, but they know that tomorrow brings a new Unicorn Frap, a new sale, and a new hustle! Stuff happens! Someone gets sick, the car breaks down, you break your arm, the list goes on and on - but the show must go on as well! Getting someone to cover that happy hour frap shift, or that close at 11 pm shift is nearly impossible for a Barista just like finding an event professional who is expected to be on-site for an event, ready to execute - knows there's no real covering that position either. When was the last time an event professional worked a day from just 9-5? No emails, phone calls, planning, or even executing onsite after hours. The schedule of an event professional is one that matches more of 'always on'. Finding professionals willing to work odd, various and often long hours is not an easy feat. However - any barista has already been doing this. They've somehow managed to adjust their internal clocks to rely on 2 hours of sleep and still perform like a rockstar! For baristas looking to expand from brewing delicious caffeinated beverages, the world of events may be just the spot for you! And hey Braden Burson? While you may think you have never been so stressed out in your life making all of those pink and blue Unicorn frap's - imagine doing it on no sleep, 3 days non-stop, while trying to wear heels or a tie, and also a multitude of other just as highly demanding and easily frustrating tasks at the same time. If you aren't completely overwhelmed, you may just be a perfect event professional one day.